The Bangalore Metro train (known as Namma Metro) commenced operations in October 2011. A much anticipated feature of public transport in Bangalore, it had been in the pipeline for more than two decades and is the second longest operational Metro network in India after the Delhi Metro. The trains are air-conditioned and travel at a maximum speed of 80 kilometers per hour. 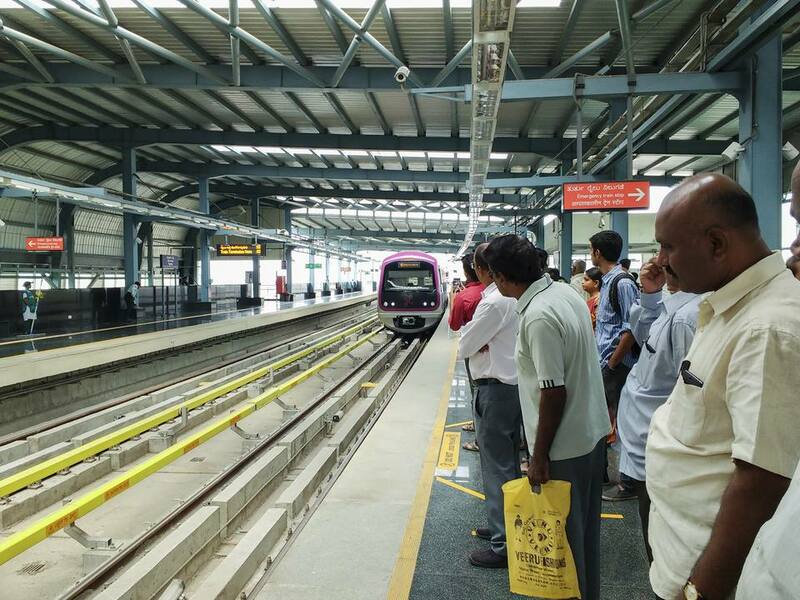 Here's what you need to know about the Bangalore Metro. The first phase of the Bangalore Metro consists of two lines -- the North-South corridor (Green Line) and East-West corridor (Purple Line) -- and covers a total of 42.30 kilometers. Its sixth and final section was inaugurated on June 17, 2017. Construction on the second phase started in September 2015. This phase stretches for 73.95 kilometers, of which 13.92 kilometers will be underground. It consists of an extension of both the existing lines, plus the addition of two new lines. Unfortunately, work has been slow to progress due to funding issues. As a result, the majority of contracts weren't awarded until the first half of 2017. The current estimate for completing the Purple Line's extension to Challeghata and the Green Line's extension to Anjanapura Township is 2020. The remainder -- a Yellow Line from R V Road to Bommasandra and a Red Line from Gottigere to Nagavara -- won't become operational until 2023. In accordance with this time frame, it's now expected that the Metro line to Whitefield will be commissioned in 2021 and to Electronic City in 2022. The remainder -- a Yellow Line from R V Road to Bommasandra and a Red Line from Gottigere to Nagavara -- won't become operational until 2023. This delay will most likely affect plans to extend Metro services from Nagavara to Bangalore airport. A third phase is currently on the drawing board. Most of the construction isn't expected to begin until 2025, with projected completion in the mid 2030s. The North-South Green Line starts at Nagasandra and ends at Puttenahalli. It's 24.20 kilometers long and has 24 stations. Tourists who are interested in sightseeing will find popular Bangalore attractions such as Cubbon Park, Vidhana Soudha, MG Road, Indiranagar, and Halasuru (Ulsoor) on the Purple Line. Krishna Rajendra (KR) Market and Lalbagh are stops on the Green Line. Those keen on heritage can also take the Green Line to Sampige Road in Malleswaram, one of Bangalore’s oldest neighborhoods (go on this walking tour to explore it). The huge fabric market at Srirampura on the Green Line may also be of interest. If you want to visit Bangalore's famous ISKCON temple, disembark the Green Line at Mahalaxmi or Sandal Soap Factory. Services on the Purple and Green lines start at 5 a.m. and run until 11.25 p.m. (last departure from Kempegowda Interchange station) daily, except Sundays. On Sundays, the first trains commence running at 8 a.m. according to the revised timetable. The frequency of trains on the Purple Line ranges from 15 minutes, to 3 minutes during peak times. In December 2018, it was announced that two extra short-loop trains had been added to run between Kempegowda and Baiyappanahalli stations from 9 a.m. to 10.30 a.m.
On the Green Line, the frequency ranges from 20 minutes to 6 minutes. Those traveling on the Bangalore Metro have the option of purchasing Smart Tokens or Smart Cards. There are different fare structures for each. Smart Tokens for single trips are available at ticket counters and vending machines at the train stations. Each one is valid for a single journey on the day of purchase. When entering a station, swipe the token at the entry gate. When departing a station, drop it in the slot at the exit gate. The minimum fare is 10 rupees. Smart Cards for multiple trips can also be purchased from stations and offer discounts of 15% off the fares for tokens. The stored-value "Varshik" is a refillable card that can hold credit of up to 1,500 rupees. It's swiped at entry and exit points at the stations, and the fare is deducted. The minimum fare is 8.50 rupees. The multi-trip "Sanchar" card, which offered discounts of up to 23%, was scrapped in March 2017. Integrated bus and Metro travel, offering unlimited journeys for a whole day, is also available for Smart Card holders. A "Saral" ticket costs 110 rupees and includes air-conditioned buses (but not the Airport bus). A "Saraag" ticket costs 70 rupees and is only for travel on the Metro and buses that aren't air-conditioned. The maximum, end to end, fare is 45 rupees on the Purple Line and 60 rupees on the Green Line. In order to ensure women's safety, the first carriage of all six-carriage Metro trains has been reserved for females. These trains currently only run on the Purple Line. The rule doesn't apply to the majority of trains with three carriages.